This recipe appered in the April 9, 2008 edition of the Chronicle. I was desperate to look at art ever since I watched the last episode of Simon Schama’s The Power of Art about Mark Rothko. As aesthetically pleasing to my eye as Rothko’s big squares of color have always been, I’ve never understood anything about them or about modern art in general until fairly recently. Reading John Richardson’s biography of Picasso, Julian Bell’s What is Painting? Representation and Modern Art helped me a great deal. Sometimes all I need to find my way into a subject is for someone to take me by the shoulders, point me in a particular direction, make a few acute observations about what to look for, and then push me off on my own. These books and, on a more accessible level, Schama’s series (on dvd) did just that for me. I’m getting to the food. I spent this past weekend at Patrice and Gary’s house in the Oakland hills so that on Saturday the three of us could go to SF MOMA. After an engrossing and enjoyable couple of hours that passed too quickly, we shared an excellent lunch of roasted eggplant soup, a grilled ham and fontina panino, and thin focaccia bread spread with romesco sauce and topped with a crab and fresh green bean salad. The SF MOMA café ought to have a posting of its own — but, too late to look back now. After a little shopping at the farmer’s market at the Ferry Building — where I had two delicious kumamoto oysters at the Hog Island Oyster Farm stand — we returned to their house to prepare dinner for two guests. 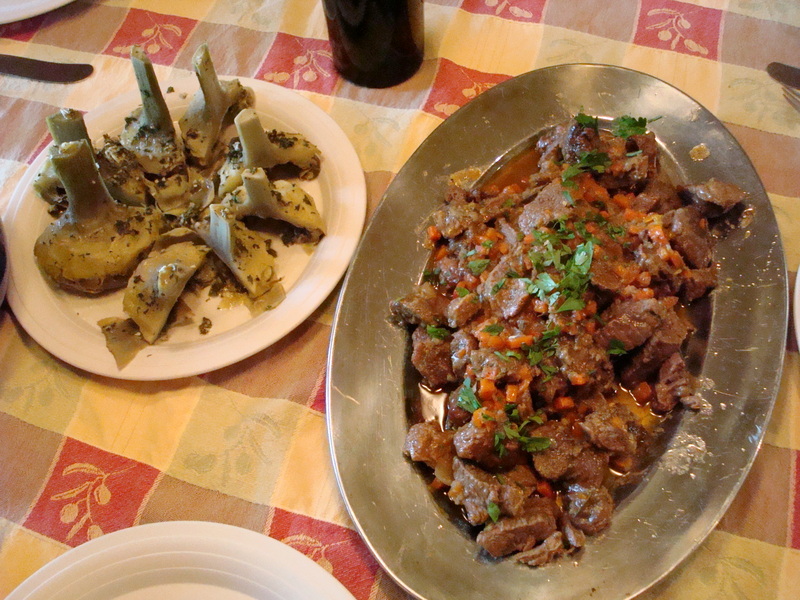 We made the following lamb recipe (it stole the show), Marcella’s artichokes alla romana, pan-fried fingerling potatoes tossed with fava beans and a little green garlic, and grilled asparagus. I think everyone was pretty happy with the outcome. Season the lamb with the salt and pepper. In a Dutch oven or other heavy-bottom pan, heat 1 1/2 tablespoons of the olive oil and the butter over medium-high heat. When the butter is foaming, add the lamb a few cubes at a time and brown on all sides, about 2 minutes. Remove to a bowl and repeat with the remaining lamb, adding more oil as needed. Pour off all but 2 teaspoons of the oil and butter, and then add the onion and leek. Saute until just translucent, about 2 minutes. Add the carrots and cook, stirring for a minute. Return the meat and any collected juices to the pan and pour in the wine, scraping up any bits clinging to the bottom of the pan. Add 2 rosemary sprigs, cover and put in the oven. After 45 minutes of cooking, add 1/4- 1/2 cup of broth, to thin the thickening sauce if necessary. Cover and cook for 15-30 minutes longer, or until the lamb is tender to the bite and the sauce is thick. Remove, stir in the minced rosemary and keep warm until time to serve. To serve, spoon into a bowl or onto a platter and garnish with the reserved rosemary sprig. In my mind, the crucial elements in this dish are the sweet butter at the beginning and the white wine during the braising. This is the second lamb recipe I’ve made that calls for white wine and I’ve come to prefer it much over lamb cooked in red wine. A little white wine (not citrusy) brings to the fore a sweetness in the lamb juices that blends exquisitely with carrot. The leek gives depth to the liquid. I used only two sprigs of rosemary instead of three. It’s important that the liquid be at a good simmer before you put it in the oven. Every time you remove the pot from the oven, turn a flame under it to bring it back to a simmer before returning it to the oven. I let the lamb braise with the lid off after the first 45 minutes, because it looked to me like there would be too much liquid at the end. The stew braised for another 25 minutes. I nearly forgot about it. When I opened the oven, I saw that the surface of the stew had a brown skin, which raised my hopes that the sauce would indeed be thick, but when I stirred the stew around I saw that there was still plenty of broth. The lessons I learned from this are 1) let things be; and 2) use a scant 1/3 of a bottle. Still, expect more of a broth than a sauce and you won’t be disappointed. The lamb was delicious with the potatoes. We were rather pleased with ourselves. A wonderful spring supper.